By Warren W. Smith Jr.
Jamyang Norbu says in the introduction to this collection of his essays that his role model is George Orwell. Having read Orwell’s collected essays, and Jamyang Norbu’s, I think that Orwell might well feel proud of his pupil. Another of his heroes is Simon Leys, the erudite Sinologist who, almost alone among those of his creed, exposed the fallacies of the Chinese Communists’ long before any others saw through their pretensions. Like Orwell and Leys, Jamyang Norbu has long railed against the lies and abuses of totalitarianism as well as against the naiveté and foolishness of his own government. This latter has resulted in his personal vilification by the good citizens of Dharamsala, who subjected him to the sort of struggle session some of them learned from the Chinese Communists for the crime of some imagined insults to the Dalai Lama. The Tibetan community thereby forever sullied its own reputation while failing to damage that of Jamyang Norbu, who has tirelessly persisted in his honest and outspoken commentary and has achieved a status as the most accomplished Tibetan writer in English – by far. 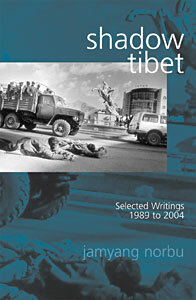 The essays in Shadow Tibet cover the years from 1989 to 2004. Jamyang Norbu’s earliest writings are available in a collection with the title Illusion and Reality. These are well worth re-reading since many are still relevant to the current situation. In fact in this volume he has a major tribute essay on George Orwell where he demonstrates how Orwell in his famous novel, 1984, foresaw a totalitarian society like Communist China – down to specific details. Jamyang Norbu is also the author, of course, of several other works, including Horseman in the Snow, the account of a Tibetan Resistance fighter; the delightful, well-researched and beautifully written Mandala of Sherlock Holmes, winner of the Crossword Prize for fiction in India; his manifesto for Tibetan independence, Rangzen Charter: The Case for Tibetan Independence and Buying the Dragon’s Tooth. Shadow Tibet begins with a 1990 essay “Opening of the Political Eye: Tibet’s Long Search for Democracy,” in which he details the abortive attempts of the Tibetan exile community to develop anything resembling true democracy. One of the most interesting observations in this essay, at least for the spiritual seekers who flocked to Dharamshala in the 70s and 80s, is that by re-empowering the religious establishment they stifled more modern and healthy secular interests among Tibetans in favor of a return to everything that was magical and mystical about Tibet. As Norbu writes, “Through their constant disdain of Western rationalism, democracy and science, Western travelers effectively discouraged Tibetan curiosity about the West, and encouraged Tibetans to revert to their old and fatal way of dealing with reality by burying their heads in the sands of magic, ritual and superstition.” Things went downhill for Tibetan democracy after that, beginning with a period of an unrealistic interest in Communism, with the Dalai Lama himself leading the way with his statements about the similarities between Buddhism and Communism. It got even worse, with a tendency for organizations to be formed on regional or factional lines rather than as national organizations. Tibetan society in exile has still to achieve real democracy; rather it remains a peculiar form of autocracy due to the role of the Dalai Lama. In “Imperial Twilight: A Tibetan Perspective on China after Deng Xiaoping,” written in 1991, Norbu makes an observation that has been reaffirmed by the Chinese people after the recent Tibetan protests. Quoting Lu Xun, the Chinese author who wrote “In his inferiority, a Chinese person is a slave; in his arrogance, he is a tyrant,” Norbu comments, “Even Chinese democrats in the West seem to suffer from this. They want freedom and justice for themselves but are unwilling to extend it to others, such as the Tibetans.” Recounting his discussions, along with Lhasang Tsering, with Chinese students during a speaking tour in the US in 1990, he says that the students denounced Beijing’s lies about Tiananmen, but when it came to Tibet they quoted CCP propaganda of the crudest kind, including “gross racial and cultural misrepresentations about Tibet and Tibetans.” His conclusion is that the necessary “moral and cultural regeneration” of China can only come about through the dissolution of its empire. In “From Tibet the Cry is ‘Rangzen’” written in 1993, he points out that Tibetan slogans at demonstrations and manifestos of the time invariably demanded freedom and independence, not autonomy. The same may be said of Tibetan demands during the 2008 Uprising. In “Broken Images: Cultural Questions Facing Tibetans Today,” he decries the deleterious effects of the Chinese “modernization” of Tibetan language and culture. These include such phenomenon as the influence of Chinese speaking style on Tibetan radio announcers and the influence on literature, drama and painting. In “The Heart of the Matter: Some Observations on the Independence Controversy,” written in 1994, he comments on the perennial debate in Tibetan politics about whether Tibetans should compromise on the independence issue in the hope that China would respond by allowing some real autonomy. He demonstrates that the flaw in this argument is that China has never expressed the slightest willingness to compromise on any aspect of its rule over Tibet. The “negotiator” with China at that time, Gyalo Thondup, had to admit that all his discussions with the Chinese had achieved nothing, and that he had been constantly scolded and browbeaten by Chinese officials who never listened to anything he had to say. Nevertheless, China has always managed to distract Tibetans and the world by making another offer to dialogue. They have done so again recently, on 24 April 2008, fooling some who imagine their offer to be new and sincere. In “Unquiet Memories: The Tibetan Resistance and the Role of the CIA,” Jamyang Norbu gives us one of the best descriptions of the Tibetan resistance on record in English, even with the publication of several new books on the subject. In “Non-Violence or Non-Action? Some Gandhian Truths about the Tibetan Peace Movement,” written in 1997, he demolishes the myth, often promoted by Dharamshala, that the Tibetan freedom struggle has always been non-violent. Nor should it have been, least of all since that was the only way the Dalai Lama was able to escape. He shows that Gandhi himself advocated violence in some instances, such as the struggle for Indian independence, and that no less an authority on non-violence than the Thirteenth Dalai Lama recommended forceful means in the defense of Tibetan independence if peaceful means were ineffective. “Rite of Freedom: The Life and Sacrifice of Thupten Ngodup,” is a eulogy to the life of a simple Tibetan who gave up his life for his country in a dramatic act of self-immolation. In “Body-Snatchers,” and “Back to the Future,” two parts of an essay with the subtitle “Enduring Phobias in Tibetan Society,” Jamyang Norbu recounts hilarious stories of the credulousness of many Tibetans and their superstitions that have persisted in exile and in Tibet. While not condemning these aspects of Tibetan society, he suggests that more scientific and secular knowledge might be more useful for Tibet in its current struggle for survival. In an intelligent analysis of Chinese literature, “Oracle Bones: Random Speculations on China’s Future,” based upon a paper presented at the Conference on Sino-Tibetan Relations in Washington in 1992, he finds no real Chinese knowledge of Tibet or sympathy for Tibetans. “No work by any author from China—or, for that matter, a Chinese writer anywhere on the globe—has in any way dealt intelligently or sensitively with Tibet—with its people, religion, history and customs. On the whole they have been uniformly and offensively racist, often with an ill-concealed vein of hostility towards even the mildest of Tibetan aspirations for freedom.” With the partial exception of one Chinese writer, Wang Lixiong, this is still true, and China and its people have recently demonstrated their continuing intolerance for Tibetan freedom. In “Return of the Referendum,” written in 2000, he ridicules attempts to conduct a referendum on Tibet’s status either within Tibet or in exile. The referendum in exile, on independence or autonomy, which was actually meant to confirm the Dalai Lama’s Middle Way Approach, turned into farce when two further options, self-determination and Samdhong Rinpoche’s satyagraha, or “truth insistence,” were added. Tibetans could have voted for more than one of these categories, since not all were mutually exclusive. In the end, the referendum was cancelled due to general confusion. Nevertheless, Dharamshala now claims that the Middle Way has been “democratically” chosen by Tibetans since they have expressed their preference that the Dalai Lama should decide. In “Acme of Obscenity” Norbu demolishes the writings of the pseudo-scholar Tom Grunfeld. In “The Tibet-China Visit According to Peanuts,” written in 2002 upon the revival of Sino-Tibetan contacts, he compares the perpetual Tibetan hope for talks to Charlie Brown’s similarly unrealistic hope that Lucy will not pull away the football she is holding for him to kick, as she has done every time in the past. But of course she does it again, once again exploiting Charlie’s hopefulness. China did the same to Tibetans’ hopefulness, from 2002, when Jamyang Norbu predicted that the renewed contacts would lead to nothing, until 2008 when, having been disappointed for too long, Tibetans resorted to violence in Lhasa and many other places in Tibet. Despite Norbu’s prescience, his predictions went against the prevailing mood of wishful thinking and were thus disregarded. Perhaps Tibetans and their supporters, who are often more unrealistic than Tibetans themselves, will have finally learned their lesson and will regard China’s April 2008 offer of talks as nothing more than the falsity that it is. In “Freedom Wind, Freedom Song: Dispelling Modern Myths about the Tibetan National Flag and National Anthem,” he refutes the Chinese contention that the Tibetan flag was invented only after 1959 by Tibetans in exile. He shows that Tibet’s flag actually has a more lengthy history than the majority of the independent countries in the world, most of whose flags are quite recent inventions. Tibet’s unique and colorful flag has most recently become familiar to many people in the world, including many Chinese, due to the worldwide publicity about the 2008 uprising. Tibet’s flag is now well-recognized as the symbol of Tibetan national identity and of Tibet’s denied right to national self-determination. In their collected form these essays compose a history of the Tibetan issue for the years they cover. Jamyang Norbu has also written many newer articles, most posted on Tibetan websites, including “Looking Back from Nangpa La;” “The Jewel in the Ballot Box;” “The Forgotten Anniversary: Remembering the Great Khampa Uprising of 1956;” “Tibetans Welcome President Hu? ;” “Newspeak and New Tibet: The Myth of China’s Modernization of Tibet and the Tibetan Language” and several others. We may hope to soon see these in a third volume of his collected essays. I am continually impressed with the literary style and references in Jamyang Norbu’s writings. I am as impressed in re-reading them as I was when they were first published and I never fail to learn something from his insights. His opinions have stood the test of time and are as accurate and applicable now as when first written. His writings are essential for an understanding of the modern Tibetan situation. I frankly do not know how anyone can claim to an expertise on Tibet without familiarity with Jamyang Norbu’s writings. I only wish that his own Tibetan government had as high a regard for his advice. Much foolishness might have been prevented had Jamyang Norbu been more heeded by Dharamshala. The North American edition of Shadow Tibet is available on line. The Indian edition is available at bookstores in India and Nepal. All profits including the author’s royalties go to bringing out new titles on High Asia Press.